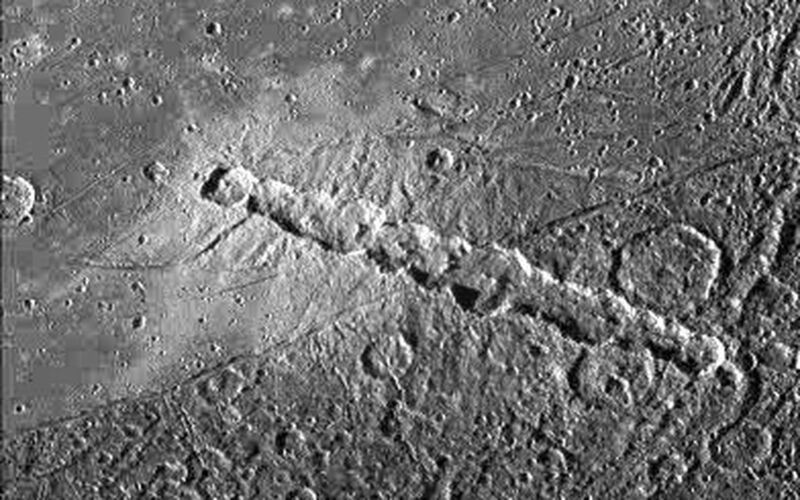 View of a chain of craters named Enki Catena on Jupiter's moon, Ganymede. 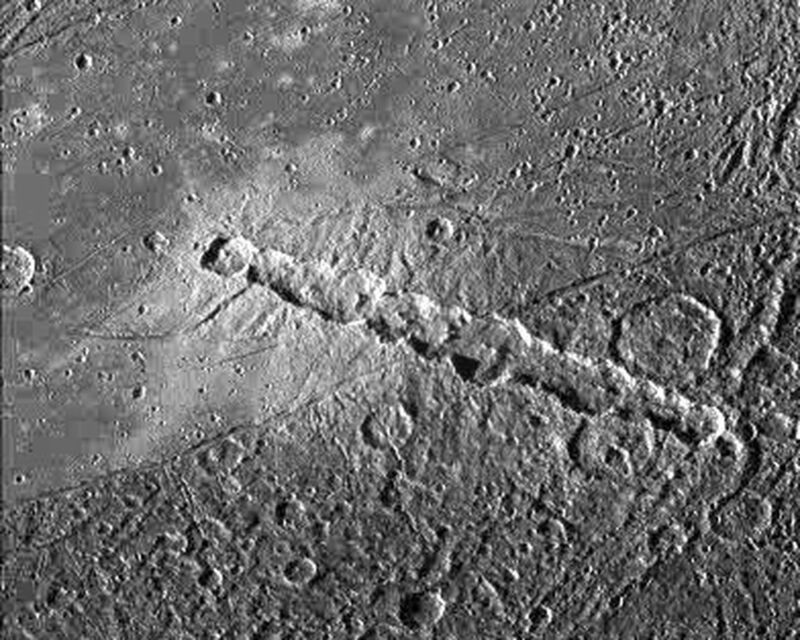 This chain of 13 craters probably formed by a comet which was pulled into pieces by Jupiter's gravity as it passed too close to the planet. 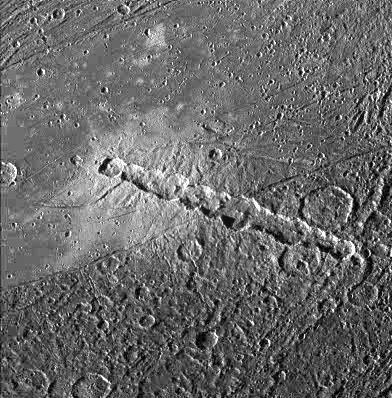 Soon after this breakup, the 13 fragments crashed onto Ganymede in rapid succession. The Enki craters formed across the sharp boundary between areas of bright terrain and dark terrain, delimited by a thin trough running diagonally across the center of this image. The ejecta deposit surrounding the craters appears very bright on the bright terrain. 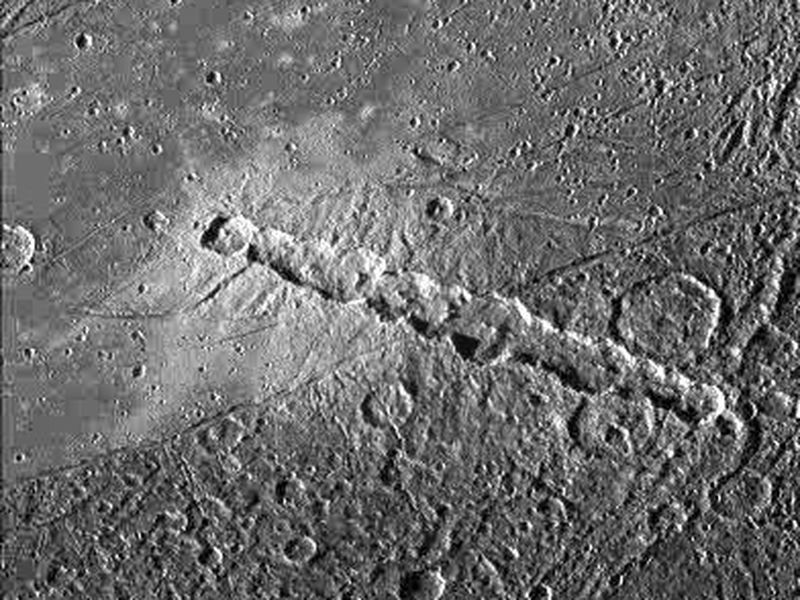 Even though all the craters formed nearly simultaneously, it is difficult to discern any ejecta deposit on the dark terrain. This may be because the impacts excavated and mixed dark material into the ejecta and the resulting mix is not apparent against the dark background. North is to the bottom of the picture and the sun illuminates the surface from the left. The image, centered at 39 degrees latitude and 13 degrees longitude, covers an area approximately 214 by 217 kilometers. The resolution is 545 meters per picture element. The image was taken on April 5, 1997 at 6 hours, 12 minutes, 22 seconds Universal Time at a range of 27282 kilometers by the Solid State Imaging (SSI) system on NASA's Galileo spacecraft.